We're here to help with all your containment liner needs. Thanks for visiting! Find out which material is right for you! Contact us for a quote on your upcoming project. Built-To-Order | Large or Small. Machine-Sewn 1/4 inch Rope Edging. Keeps Wildlife Safe From Contaminants. John Terry Sales is located in Denver, CO but there are many containment liner fabrication plants that we work with throughout the country. John Terry Sales Company, est. 1988, has been providing containment liners for the oilfield and other industries for 30 years. We strive to provide great prices with great service. Our company mission is to make our customers priorities our top priority, we offer competitive pricing and fast turn-around on orders. We know how the oilfield is and we understand the pressure that comes along with needing a liner, and needing it yesterday! 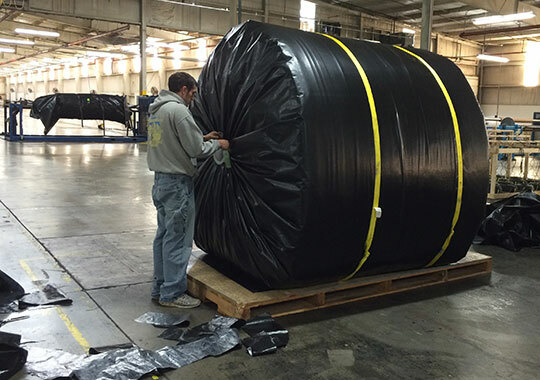 Custom built-to-size containment liners are delivered in a week or less in most cases. If you need it sooner, we'll do everything we can to make it happen. We're used to rush orders and can usually get the job done. If an order needs to be placed, call us and you'll get ahold of John Terry (Father) or Trip Terry (Son). We're happy to answer questions and make sure we get you the right containment liner to do the job properly. Please call or use the contact form, it goes straight to our email! 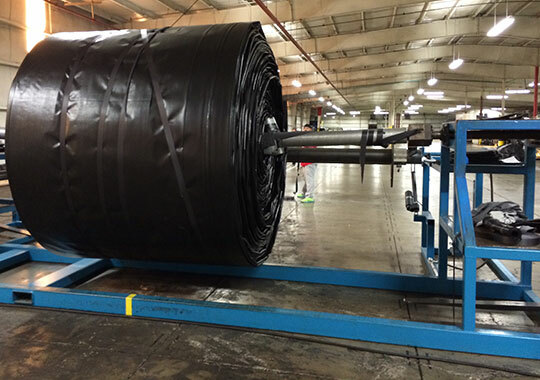 Here we have a very large liner pushing the limits of the winder, all rolled up and ready to be prepped for shipping. This is the same liner wrapped and ready for shipment. It was a big one, 400' x 400' of the 16 mil woven polyethylene. 160,000 square feet!